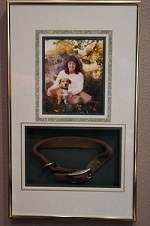 Designing and framing memories for shadowboxes are a big part of custom picture framing. When a customer comes into the store with items that mean something to them, the first step is listening to the stories behind these items and why the customer cherishes them. We take this very seriously, making sure we have the feel for how this person wants to capture the memory. 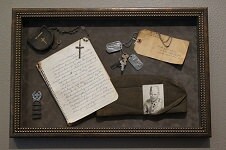 Military honors, vacation memories, baptismal gowns, sports jerseys and concert memorabilia are examples of what a custom picture framer encounters on a regular basis. This story begins in Wichita, Kansas, at the Intrust Bank Arena. It was the client, John’s birthday, and he and his family were there to see his favorite band, the Eagles. As he told the story, it became quite clear that the Eagles’ music had touched him in a special way, and this concert was an event that he will hold dear forever. The design of this shadowbox had to be just as memorable. 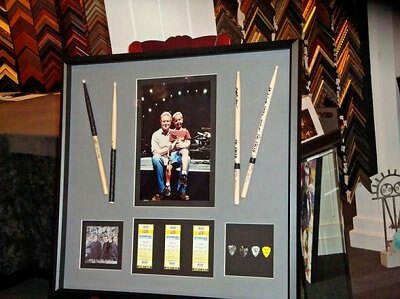 Next were autographed drum sticks that were given to young Kyle after the show. These weren’t brand new sticks out of the box, they were the sticks used during the show, taped up and worn from the last few hours of use. Since the sticks were about the same length as the photo, we decided that they would fan out on either side of the picture, which gave the piece great proportion. After this, we laid out the tickets for the show directly under the photo of Kyle and Don Henley. These tickets were personalized, showing the names of all who attended the show. We laid out the tickets in order, (seats 8, 9, and 10) making sure that this layout was as wide as the photo above it. The piece was looking great, but it needed more. Before I even had the chance to ask John if he had anything else that he wanted to add in, he showed me an autographed CD cover from the band’s album “Hole in the World”, which would be placed to the left of the tickets, and personalized guitar picks from each band member, which would be placed on the right. 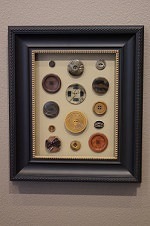 At Gallery 1 of Delafield, we strive to give you the best quality custom framing available. Come in with your memories and we will create something that you will love!